If the building management system is the brains of a HVAC system and pumps are the heart, then the pipework is the cardiovascular system, distributing water, refrigerant, air and gas around the building to ensure it operates effectively. Getting pipework right saves money, facilitates greater efficiencies for the HVAC plant relying on it and boosts energy efficiency, whilst limiting noise. The integrity of pipe systems depends on a number of considerations and principles that must be observed when designing, constructing and maintaining them. 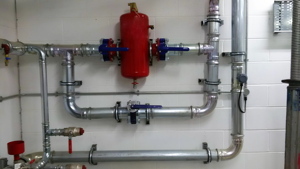 Pipework is made up of a variety of components including pipes, fittings, flanges, supports, gaskets, bolts, valves, strainers, flexibles and expansion joints. These, in turn, are available in many materials, types and sizes. Because of the complexity of specifying pipework systems it makes good business sense to talk to an expert supplier about the best options for specific circumstances. However, there are some general principles that apply and these are what I will talk about here. First let’s consider materials. While copper has traditionally been the material of choice for both hot and cold water systems, this is starting to change as non- metallic and lined or plastic piping systems grow in popularity. The Health and Safety Executive recommends: “The selection of the material of construction should take into account variation in process conditions that may occur under foreseeable upset conditions. The strength of some materials changes considerably at elevated temperatures. It also says procedures should be in place to ensure that deviations in process conditions such as fluid temperature, pressure and composition are identified and assessed in relation to the design of the pipework. Selection of pipework should not be based on price alone. Cost stability is also intrinsically linked to pipe materials. For example, price fluctuations of copper and steel can change the cost dramatically between the time of specification and purchasing. Steel systems are suitable for non-potable applications, an are a simple robust option which is competitive but heavier and less clean to install. Mechanical jointing systems can be specified instead of welded joints in larger sizes and are suitable for higher pressures. Plastic pipes can be less expensive than metal, lighter in weight and will not rust or corrode. Plastic also has insulation qualities that prevent condensation from forming on pipes carrying cold water. And they can simplify installation because they are easy to cut, have the capacity to incorporate push-fit joints and offer excellent flexibility and handling qualities. On top of this, no welding or soldering are required. There are, however, upsides to copper too. For example, it is a naturally corrosion-resistant metal that can withstand high pressures. Copper is also light, making it easy to work with, saving on labour costs, and easier to extend over long stretches without supports. Finally, copper is more environmentally friendly than plastic pipes because it consists of naturally occurring metal, whereas synthetic plastic is responsible for significant ecological damage during its manufacture and disposal. 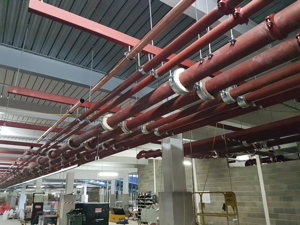 A particular trend in construction is for offsite prefabrication of pipework. Not only does prefabrication enable a consistent product to be produced, but it also results in a shorter production cycle and fewer trades on site. Prefabrication has a positive impact on product performance because build quality is tightly controlled and precisely measured. Prefabricated construction ensures conformity to building standards and prefabricated units make the installation process predictable and relatively easy to plan. However, purchase price and cost of overall installation remains the core determining factor when it comes to specifying piping systems. By some estimates, the ‘visible’ cost of pipework can be as little as 15% of the whole life cost (which takes into account the total cost of a product or service over its lifetime, including issues such as speed of installation, service, warranty, support and reliability). That’s why the cheapest option can easily become the most expensive in the long-run. The financial implications of installation can be considerable and pipework can have a disproportionate impact on a project. Pipework can, for example, cost as little as 5% of total installed costs on a project, but can eat up as much as 30% of the man hours. A large part of installation involves how the pipes are joined together. Conventional copper pipework connection typically requires soldering on site. This has several disadvantages, among them the fact that a ‘hot work’ permit is required. Press fitting, on the other hand is a relatively simple cold process that creates reliable, tamper-proof pipe connections from the single action of a special compression tool. Flame-free installation avoids the need for a hot work permit and the risk of fire on site. It also means there is no need to waste an entire working day as the installation cools down. And, no brazing or oxygen-free nitrogen purging are required, which accelerates installation and enables installers to be more productive. Indeed, press fitting cuts time on site (by up to a third, according to some estimates). This means lower overheads for the installer.